It doesn’t take much thought to realize the positive potential of data in the world of business. Digital data is no mystery to us, business intelligence and analytics have that covered—but what remains as a mystery to many is how to digitize those paper documents and apply the same analytical process. What does it really take to go paperless? And why are so many businesses struggling to get this initiative off the ground? 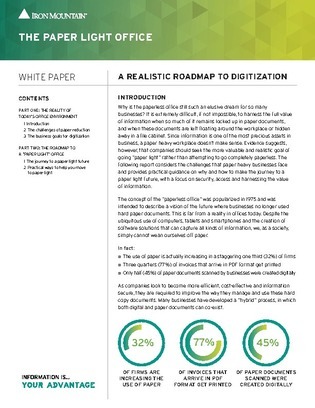 The following white paper explores the current state of document digitization and provides reasons and strategies to achieve a paperless enterprise. Read on to learn more.